1996: Looking Back At INDEPENDENCE DAY UK | Warped Factor - Words in the Key of Geek. Matthew Kresal crosses the Atlantic for Independence Day UK. 1996 saw one of the biggest films of the decade being unleashed upon the big screen. Independence Day's tale of alien invasion has often been criticized for being perhaps too American centric in its narrative, only paying token mention of the larger worldwide nature of the invasion. 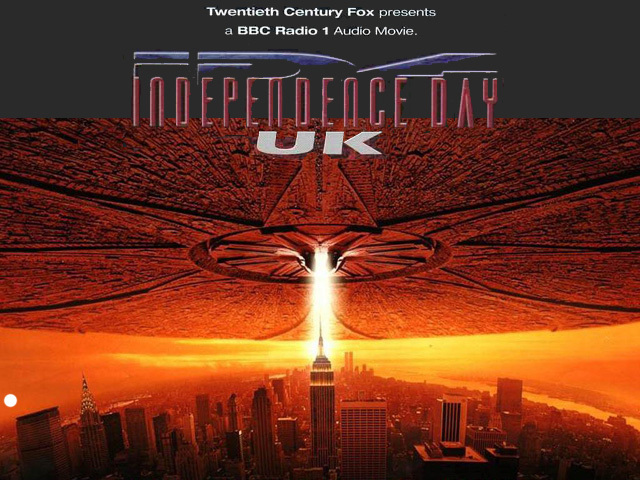 Perhaps serving to rectify that a bit, as well as give the film a bit of publicity in the British isles, was Dirk Magg's BBC Radio 1's “audio movie” Independence Day UK which presented the events seen in the film's first hour from a distinctly UK perspective. Aired on the fourth of August 1996, the hour long production takes some cues from Orson Welles' (in)famous 1938 The War Of The Worlds broadcast. Opening with a mention of that broadcast and how the waning of the wireless medium means such a thing like its panic could never happen again (“Could it?” the reader asks), the story heads into the famous 20th Century Fox theme before picking up with a live broadcast via BBC Radio 1. Maggs takes listeners onto a RAF Sentry aircraft participating in an attempt to triangulate a signal as part of “UFO Watch” with DJ Nicky Campbell and the famed astronomer Patrick Moore with Campbell broadcasting. It's here that we also encounter RAF Group Captain Phil Johnson (played by Sixth Doctor actor Colin Baker) and, after some swapping back and forth with the Radio 1 studios, they eventually discover that what they've detected is the alien spacecraft bound for London. Listeners get to hear the immediate aftermath of its arrival in the lead-up to the single most iconic moment of the film. For it's opening twenty minutes or so, ID4 UK presents an interesting “you are there” take on the events of the film. 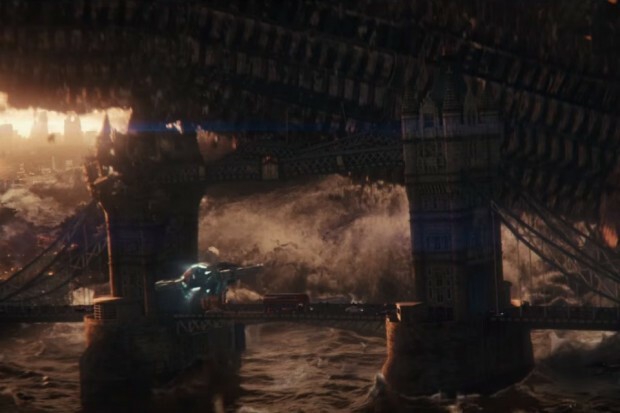 Once the alien destroyer opens fire on London, the production switches gears for its remaining running time. Following a brief pause as Radio 1 “ceases” broadcasting (another homage to Welles' broadcast), ID4 UK turns into an all-out audio movie. There's a series of fast-paced dogfights, an attempt to save the Royal Family via helicopter and even an encounter between Patrick Moore and one of the alien invaders. With the various RAF characters in position to continue the battle against the aliens, the production ends on a hopeful note, though one British character remarks "when this is all over and we've defeated these monsters, the Yanks'll take the credit for it, you wait and see." That last line is one of the neat things about ID4 UK. Though Dean Devlin (the producer and co-writer of the film) was on-board as a creative consultant, Maggs was kept from revealing certain details about the film including its ending. Perhaps because of that, Maggs was able to take on some of the plot issues from Independence Day and at least try to explain them. Take the giant alien mothership with a diameter ¼ the size of the Moon that ought to be having some effect on tides and made its presence known here on Earth ahead of its arrival. In a scene early, Moore points this out while on the line with a fellow astronomer which leads to an explanation being given through speculation about anti-gravity technology. The production also shows that the fight back has a more international scope that what the film actually is able to show (though, perhaps to its credit, the film actually made an effort). Maggs has fun with that aspect of it and it helps to lift ID4 UK above being a simple stunt. The casting of it is also interesting with its mix of real-life figures playing themselves, actors playing real-life figures, and established actors. Patrick Moore probably comes across the best of the real-life figures carrying both a sense of authority as a scientist but also horror and even amazement at the events unfolding around him. That said, Radio 1 presenters Nicky Campbell and Mark Goodier do good jobs of portraying themselves covering the film's early events. While the impressions of John Major and Tony Blair heard briefly in a single scene are perhaps less successful, the rest of the cast does well. Colin Baker is firmly believable as an RAF Group Captain on the sentry aircraft as is Toyah Willcox (whom, as an American, I was surprised to discover is apparently a UK pop star) as his wife, an RAF fighter pilot. The rest of the cast is made up of UK voice acting stalwarts including Toby Longworth and Simon Treves, with the overall result being believable in bringing to life a realistic take on the film's events. The true highlight of this, as with so many of Maggs productions, is the sound design. Maggs pushed for realism and epic soundscapes that could rival even what Big Finish (the makers of Doctor Who audios) have become famous for doing, and this is certainly present here. It's been said that, in order to achieve authentic aircraft sounds, Maggs' crew recorded actual aircraft and cockpit interior sounds at an RAF base. I suspect that's true as there is a strong sense of both claustrophobia and verisimilitude to all of the aircraft scenes. Combined with both David Arnold's score as well as sound effects from the film and the result is a full-on audio movie of the highest order. No wonder then that it won a 1997 Talkie Award for Best Production. Sadly though, ID4 UK has been left to largely relegate in obscurity. Though it received an audio cassette release and one an award, the production has largely been forgotten about due to the lack of either re-broadcasts or a CD/download release. Yet dig around the internet and chances are you'll find it somewhere. If you do, you're in for a treat and an unlikely spin-off of one of the biggest films of the 1990s.